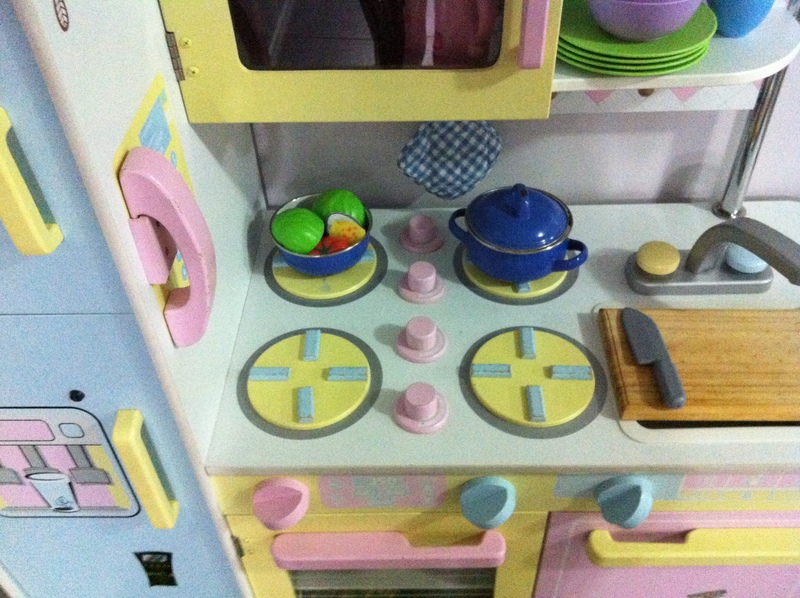 Miss L was lucky enough to be given her cousins’ lovely timber play kitchen a couple of years ago. She spends hours in it – preparing picnic food, supper for her toys, whipping up cakes and batches of biscuits, making tea…not much dish washing goes on though. Hmmm…I might have to encourage that a little. The kitchen is stocked with a few hand-me-down items (little metal pots, fruit and vegies, teapot), but mostly it contains old real kitchenware and items otherwise destined for landfill or recycling. 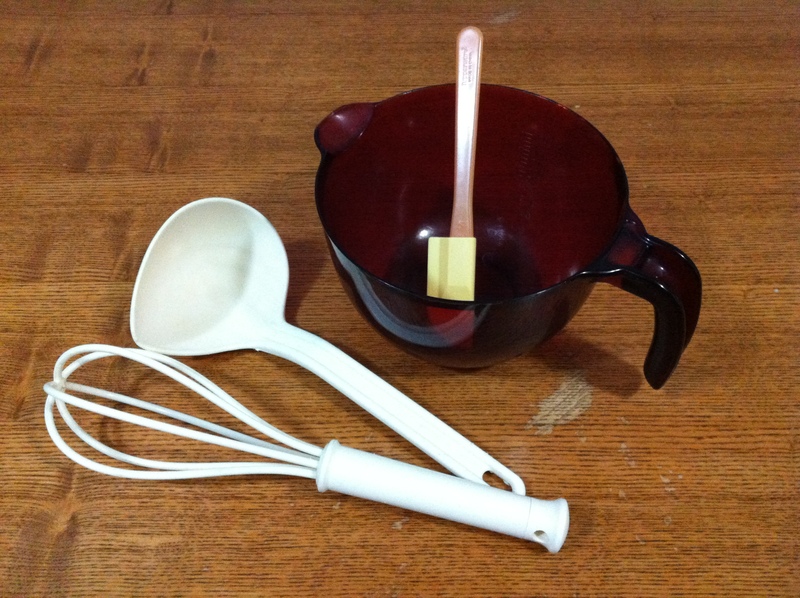 Shabby or slightly broken cooking utensils and equipment that no longer has a place in my kitchen, often end up in Lucy’s – a perspex jug that cracked when it fell onto the tile floor (repaired with superglue), worn plastic mixing bowls, a ladel and whisk, a wooden chopping board, and even old tea towels. I find it quite silly that you can actually buy pretend packages and food containers for children’s play. Once empty, the real ones make far superior toys for the play kitchen because they are the real thing – you can’t get any more authentic! Plus by reusing these containers we are doing something positive for the environment and teaching our children about reducing waste. I especially like to use containers that aren’t recyclable, since if they’re not used for something else after the food, their next destination is the bin (I try not to buy food in non-recyclable packaging though). 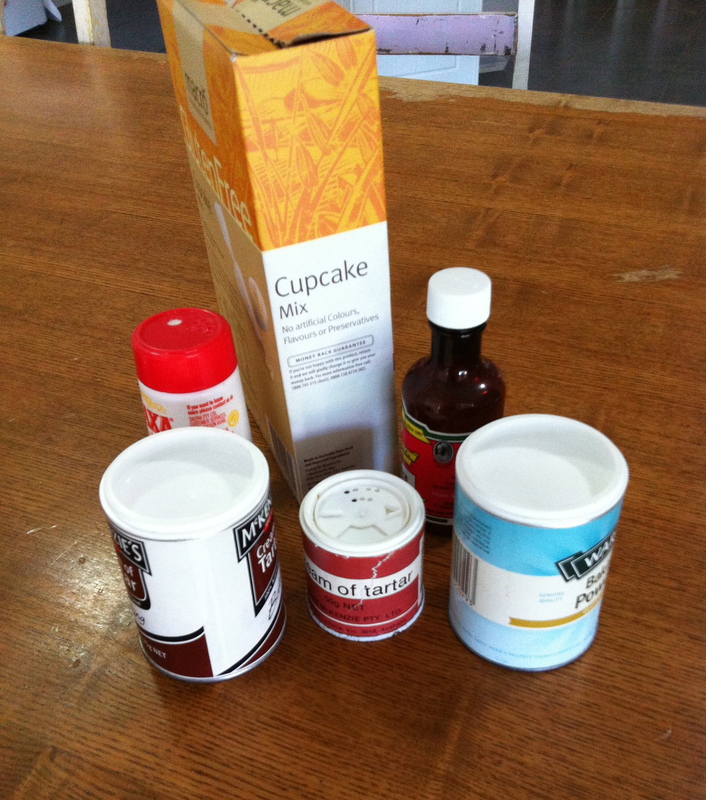 The containers/packaging might serve a different purpose in the pretend kitchen – think outside the square. 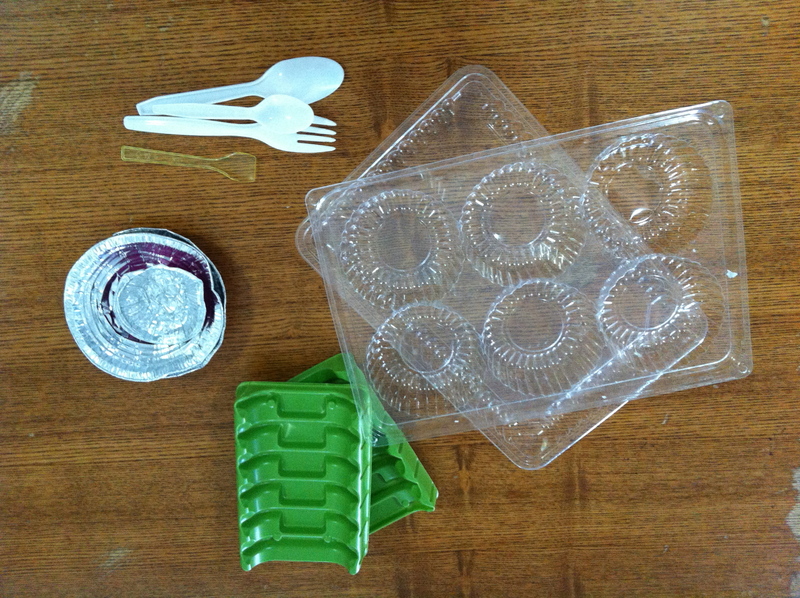 Plastic trays become oven trays, plastic trays with little depressions for cakes/muffins become muffin trays. Also, containers that hold some basic cooking staples (especially for baking) and can be easily recognised by kids are a must. Salt and pepper (in the plastic shakers), baking powder, cream of tartar, vanilla, egg cartons, butter/margarine containers all help to make the kids’ kitchen more authentic. The tea set is a lovely, very sturdy one made of 100% recycled plastic milk cartons. It would be very simple and inexpensive to make up a tea set from charity shop finds – espresso cups and saucers are ideal as they’re small, and likewise there are plenty of small size teapots around. If the kids are too young to handle crockery without breakages, then choose stainless steel or plastic (if you can find it). Or just buy a second hand play tea set…but the real stuff is very cool! Miss L also has a gorgeous vintage Japanese tea set that was passed on to her by a special Great Great Aunty who had kept it since she was six-years-old. That’s packed away for another year or two! I'm an Aussie mum of two littlies and I'm into making things, growing things, old things and living things. All whilst trying to tread lightly on our planet.